The Circle City Donut Dash 5K, presented by American College of Education and benefiting Teachers’ Treasures, returns for a third year of tasty fun on Saturday, February 17. Not sure if the event is for you? Here are 6 reasons that could change your mind! 1. Free Long’s donuts! Thanks to event sponsor Farmers Insurance, everyone gets to enjoy tasty glazed Long’s donuts at the event after party. 2. The Donut Challenge. The 5K features two fun events, a standard 5K experience and the Donut Challenge, where participants attempt to down a dozen delicious glazed donut holes at the midpoint of the race. But don’t worry, those not up to the challenge still have plenty of access to donuts after the race. 3. Free Shopping Pass for ALL Teachers. As a race supporting Marion County teachers and kids, teachers are highly encouraged to take part in the race--especially those from school systems not traditionally shopping eligible. ALL teachers who register for the race can use code TEACHERS to take $5 off their registration. In addition, they’ll receive a shopping pass to use at Teachers’ Treasures on a later date. 4. Crazy donut attire. From donut leggings to jewelry, this is a chance to rock your love of donuts with the craziest attire you can find. Three Best Dressed awards will be presented after the race, including Best Dressed Individual, Best Dressed Team, and Best Dressed Teacher Team. The winning Teacher Team will receive coffee and donuts delivered to their school courtesy of Farmers Insurance. 5. Complimentary Sun King! Sun King has been a generous partner for the past three years, bringing a special coffee-infused beer to pair with your donut. All participants 21 & up (and who have their ID on hand) will receive a complimentary pint to celebrate the end of the race. 6. Supporting Indianapolis teachers and kids in need. Every registration goes to support Teachers’ Treasures, a non-profit that obtains and distributes school supplies free to teachers of students in need. Every day countless Marion County students struggle with access to basic school supplies like pencils and paper, often relying on teachers to help get them the tools they need to succeed. Over 100,000 kids are impacted by Teachers’ Treasures each year. Ready to sweeten your February with a little donut fun? Regular Registration is $35 through February 16. Day of Registration is $40, but those who bring a school supply donation will receive $5 off. Get all the details and register here . Its February and you are now one month through the new year, new you campaign. You survived the January detox and now are looking for some February fitness . Well luckily for you Sun King has just the recipe to reward you for surviving the detox and help you reach peak fitness! Sun King is hosting community fitness classes at our downtown tasting room. These classes will last just around an hour, and will feature a rotating array of trainers and workouts! Tickets are $10 per session and can be found online or via the events tab on the Sun King Facebook page. The proceeds of your tickets will not only get you a quality workout class but will also be donated to local Indianapolis charities to provide opportunities to make sure everyone has a great 2018! Act fast because these events are capped at 50 attendees; tickets will be gone faster than winter sunlight. Can't get a ticket to a class? Don't fret! Sun King will be hosting community fitness events every Saturday from now until March. Each month a new trainer or studio will be joining Sun King for new classes. Rotating fitness classes like our beer selection will ensure no Saturday will be the same! February’s classes will feature two Sun King favorites, Naptown Fitness and Invoke Studio! Doors open at 9 with classes starting at 9:30 and running until 10:15. All classes will take place at the Sun King downtown tasting room. Directions to our downtown tasting room can be found here. Join Invoke Studio for Yoga at Sun King Brewery! These hour long classes will begin promptly at 9:30am, with doors opening for the event at 9:00am. Please bring your own mat. Invoke instructors will lead an all-levels yoga class in the tasting room. All proceeds benefit Every Dog Counts. Come burn off some calories in preparation for Super Bowl Sunday with Sun King and Naptown Studio! Coach Kendra Goranson from NapTown Fitness will lead you through a fun 45-minute SWIFT workout. SWIFT is a NapTown Fitness program that stands for Sweat with Indy for Time. This boot camp style bodyweight workout is sure to get your Saturday morning started off the right way. All proceeds benefit Growing Places Indy. Sun King is invested in giving back to the Indianapolis community we share with our loyal fans and friends. As always, we stay true to a variety of causes, good beer and active community involvement. Each month, on top of our already famous donation jar givebacks, we have revamped our #GiveBackThursday initiative. This year, a new organization will receive $1 back from every growler fill, every Thursday of the month. On top of that, on two Thursdays a month, our selected partners will activate our tasting room with a mission-focused activity and receive $1 from every pint sold in our taproom that evening. This month, we’re highlighting School on Wheels. School on Wheels provides one-on-one tutoring and educational advocacy to school-aged children impacted by homelessness. Their vision is to break the cycle of homelessness for these children by equipping their entire family with the educational tools necessary to achieve success in life. Join School on Wheels for a #SharetheLoveIndy Encouragement night at Sun King on Thursday, February 8 from 5-7:30 pm. Homelessness is hard at any age. While School on Wheels tutors and staff offer support to all their kiddos during the tutoring hour, additional inspiration goes a long way. Bring positive thoughts and words of encouragement, and we’ll provide the art supplies. You’ll have the opportunity to write notes of affirmation that will be placed in kids’ backpacks and be handed out during tutoring. You can also make Valentines to give to your friends and family while you learn more about how YOU can help break the cycle of homelessness through education. Thursday, February 22 School on Wheels, in partnership with Half Full Nelson, (link to hfnelson.com) will bring a Virtual Reality exhibit to Sun King that lets you experience one homeless child’s after-school routine. Callie, a first grader and School on Wheels student, will take you on a tour of what she does the moment she steps off the bus until it’s lights out at her shelter. Callie’s reality is something over 5,000 children in Marion County experience each year, and School on Wheels will give you ways you can help them break the cycle of homelessness through education. Each month, both of our downtown and Fishers tasting rooms highlight different organizations to benefit from the donation jars at each location. Instead of taking tips, we wanted to give our great fans the opportunity to invest in the betterment of the Indianapolis community while quenching their thirst for beer, because, without the Indianapolis community, we don't know where we would be today. Throughout February, Child Advocates and Outreach Inc will benefit from our downtown locations donation jars. At our Fishers location, Food Rescue and Prevail will benefit. A further description for each organization can be found below. Come share a beer with us and these amazing organizations this February! Child Advocates, formerly known as the Guardian Ad Litem Project, was founded by the Indianapolis Section of the National Council of Jewish Women (NCJW) in 1982, because NCJW and the courts recognized the need for abused and neglected children to have independent representation. In 1988, NCJW turned over the Guardian Ad Litem Project to the Indianapolis Legal Aid Society. In 1982 the project was incorporated as Child Advocates, Inc. and became a stand-alone agency.Child advocates number one goal is to provide independent, child-focused representation to every child who has suffered abuse and/or neglect. Child Advocates is the only agency to hold contract with the Indianapolis Juvenile Court to provide this service. Prior generations are responsible for the current mindsets and policies regarding food waste in America. Food Rescue believes the best hope to solve the food waste crisis, (the crisis of having an abundance while ignoring those in need and potential environmental damage caused by food waste) is to engage future generations through education and leadership development. Our K-12 Food Rescue Program in 500 schools addresses the estimated 1 billion Unwanted, Unpeeled, and Unwrapped food items wasted annually in America, and simultaneously engages students to lead us out of the mess through our Student Leader Entrepreneurial Initiative, or S.L.E.I. for short. (Pronounced SLAY). Food Rescue is actively seeking High School student leaders to become the face of the school food waste issue, and subsequently lead our country into a new mindset. Food is not trash! Outreach is a faith-based nonprofit organization in Indianapolis, Indiana, that reaches out to homeless young men and women (14-24) with the compassion of Jesus Christ. Their goal is to equip and empower these at-risk young people to achieve stability and life transformation.Homeless youth come to Outreach when they have hit rock bottom. Abandoned, abused, and forgotten, they live on friends’ couches, in shelters, hotel rooms, abandoned buildings, even the street. Many hope they can just make it to tomorrow, much less dream about graduating from high school or going to college. They are isolated, alone, and at a crossroads. Prevail, Inc. educates and engages the community to prevent crime and abuse while helping restore the lives of those who have been affected. Our community is safe; however, when crime and abuse occur, our response is compassionate and restorative. Prevail believes in the power of education, awareness and empowerment. With integrity and leadership, Prevail sets out to carry out its mission. For the entire month of February both Sun King locations will be celebrating YOU - lovers of canned craft beer, devoted customers, and our best beer buds! We thank you for all that you do. Sun King will be hosting various promotions, events and contests to celebrate our annual February Customer Appreciation Month. BE OUR GUEST to a Private Sun King King's Reserve Party! How does one manage to score a Golden Ticket for you and a guest to this awesome private party filled with sampling from cellar full of sour beers, seasonal beers, barrel-aged beers, food, music, and more? We will have 3 weeks of chances to win by playing one of our trivia contests or if you are a social media kind of person we will have 2 chances to enter to win through our Instagram contests. Follow us on Facebook…Wait a second, you aren’t already following us? - Answer the posted trivia question by leaving the right comment for a chance to win a Golden Ticket. One winner will be selected. A. Sign up for our weekly Newsletter and answer the week 2 trivia question. - All answers will be submitted through our newsletter for a chance to win a Golden Ticket. One winner will be selected. B. Attend the “The Boy Who Lived” Trivia Night at our Sun King Fishers Tap Room on Feb. 6th. If you think you know everything about Harry, Ron, and Hermione's adventures in the book series then you have a chance to win! Grand Wizard, whoops, grand prize winner will win a golden ticket. A. Twitter me this! Follow us on Twitter for a chance to solve our final social media trivia question. - We will tweet out a question and all correct tweets back will be entered to win a Golden Ticket. One winner will be selected. B. Attend the “Indiana Sports Ball” Trivia Night at our Sun King Fishers Tap Room on Feb. 20th. It doesn’t matter if you are a Hoosier, Boilermaker, Bulldog, or Irish…show your school pride and grab your friends, and let’s play trivia! One grand prize winner. We want to know, How Do You Enjoy Sun King? Get creative, use the hashtag #IWANTMYSKB from Feb 1st until Feb. 22nd to be entered to win. Whether you are cooking with Sun King, enjoying a pint in our Tasting Room or Tap Room, exploring nature with a Sun King can - you can enter to win a Golden Ticket by using #IWANTMYSKB on Instagram. Be sure to also tag @SunKingBrewing in your picture. We will pick the best picture for the Golden Ticket, however, we will reward the 2nd place and 3rd place pics with Sun King prizes. 1st, 2nd, 3rd place pictures will be reposted on our Instagram account. Head to the Sun King Booth at the Brewers of Indiana Guild Winterfest 2018 (Feb. 3rd) and find Marty the Party Piñata! Take a photo, post on Instagram use hashtag #WheresMarty. All entries must be done on February 3rd during the Winterfest to be considered and you MUST use #WheresMarty for a chance to win. If Sun King reposts YOUR Marty pic on our Instagram account, then you will receive a Golden Ticket. One winner will be selected to win a Golden Ticket. The fun doesn't stop there! We've got some other treats and promotions up our sleeves. Every Monday will be “Merch Mondays” at both Sun King locations. ALL merch will be 20% off on those Mondays! That’s right, 20% off sweatshirts, tees, glassware and more. The offer is only valid at both Sun King locations. Dollar-Off Pint deals every Tuesday for the month at both SKB locations! $1-off full pours and 50 cents off half pours. Not too shabby of a deal. We’re gonna party each Wednesday like it’s 2-0-0-9! Each February Wednesday, we are kicking it old school with $5 growler fills on Sunlight Cream Ale, Wee Mac Scottish Ale, Osiris Pale Ale….AND PACHANGA. That's right, you can get a 64oz growler filled up with your favorite Sun King flagship beers and Pachanga. Join School on Wheels for the #SharetheLoveIndy event on Thursday Feb. 8th from 5-7:30pm at Sun King Brewery Downtown. As a part of our #GivebackThursday programing, $1 per pint will be donated to School on Wheels and to help fund their fight against homelessness. School on Wheels will have special create your own Valentines stations! Make your sweetheart something special and sip on a pint for a good cause. On Thursday, Feb. 22nd School on Wheels will be back with Half Full Nelson to bring you a Virtual Reality exhibit at the Sun King Brewery Downtown location. The exhibit lets you experience one homeless child’s after school routine. Callie, a first grader and School on Wheels student, will take you on a tour of what her routine looks like the moment she steps off the bus until lights out at her shelter. $1 per pint will be donated to School on Wheels on this event. You made it...It's the end of the blog. In case you skimmed over all of the contests and promotions, we will be posting all via social media throughout the month to remind you! Looking to jumpstart your year, but not really looking to give up beer? New year, new you doesn't mean you always have to sacrifice pints for quinoa. Sun King is here to help you become the best version of yourself! Don't fret! Sun King will be hosting community fitness events every Saturday from January through March. Each month a new trainer or studio will be joining Sun King for new classes. Rotating fitness classes like our beer selection will ensure no Saturday will be the same! January’s classes will feature two Sun King favorites, Studio 317 Fitness and Fire Eye Fitness! Doors open at 9 with classes starting at 9:30 and running until 10:15. All classes will take place at the Sun King downtown tasting room. Directions to our downtown tasting room can be found here. Join Studio317 for a Rise & Grind Bootcamp style class that will benefit Heaven After Hell Animal Rescue Center. Studio317 strives to help you maintain a healthy balance between your workout goals and your life. Their motto is to IMAGINE. INSPIRE. IGNITE. If you can imagine it, you can achieve it! Tickets can be found here, and be sure to save some change as dog treats will be available for sale all proceeds benefit Heaven After Hell Animal Rescue Center. Kickboxing with Fire Eye Fitness matches fun and intensity together for an AWESOME class. Attendees develop strong lean bodies while losing unwanted weight. Our interactive class is fresh and new while burning tons of calories. You don't want to miss out on this class! Tickets can be bought here! Proceeds benefit the Make-A-Wish foundation. Goodbye 2017! Say hello to 2018! We made it to 2018 and we could not have done it without your support and love for independent craft beer. A lot happened in 2017 and we wanted to highlight a few accomplishments and give you some insight into what is in store for 2018! You asked for more beer and we released more styles, in both package and draft than ever before, complete with more Sun King King’s Reserve Series beers. We even won some medals throughout the year at the Commonwealth Cup, the Indiana Brewers Cup, and the Great American Beer Festival. We kicked 2017 off with Lupulin Astronaut IPA in 16oz cans designed by in-house artist William Denton Ray. This citrusy IPA made a return to our 2018 seasonal IPA lineup and can be found in cans and draft at both Sun King locations and cans at retail locations. Our 2018 seasonal IPA lineup will feature Alrye’d Alrye’d Alrye’d, Grapefruit Jungle (GFJ) IPA, and Foxy Jam Pants. This past spring was the introduction of our pal Marty the party Piñata with Pachanga Mexican Lager. Easily a favorite of the Sun King Crew because of its sessionable taste and because of the high demand of our patrons, we’ve decided to make Pachanga available year-round That’s right, you are the first to know, Pachanga will be available year-round and you will find 12 packs alongside the 6 packs of 12oz cans this spring. Don’t forget to share your #WheresMarty pics on social media and we may just share your pic! See into the future… Check out our 2018 production calendar. In the spring, we placed the last of our four, 420 barrel tanks that can be seen peering out of the top our downtown Indy brewery location, allowing us to brew more Sunlight, Wee Mac, and Osiris. We also upgraded our kegging line to a new state of the art machine in order to increase our efficiency and ensure that the kegs our beer goes into are the cleanest and therefore our beer tastes fresher and better for longer, plus it makes washing and filling kegs much easier on the production crew. That’s not all that happened inside the brewery. We undertook a full refresh of our downtown Tasting Room, complete with upgraded bathrooms, a new bar with stools for kicking back on and enjoying a beer at the source, and a lot of other great upgrades that you have to stop in and see with your own eyes to believe. We partnered with long-time friends, Goose the Market/Smoking Goose, on opening a new concept, Oca , inside of our downtown Indy tasting room. You can now grub on sausage sandwiches, pizza, cheese plates, and pretzels with beer cheese while sipping on something from one of our 15+ available beers on tap every day, plus our Sun King King’s Reserve Cellar List. 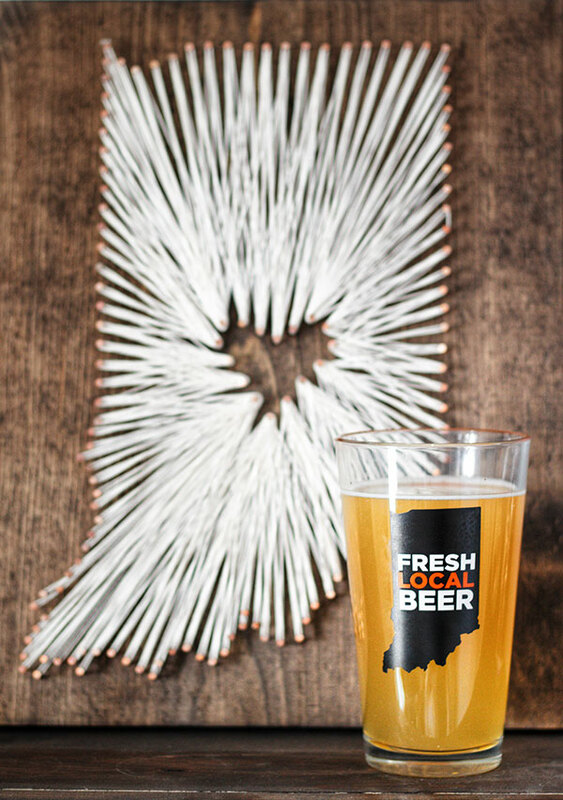 We update our draft lists daily for our Sun King Fishers Tap Room and our Sun King downtown Indy Tasting Room locations. The summer of 2017 was quite busy! We celebrated our 8th Anniversary with 3,000 of our closest friends, GFJ IPA, and live music from Tyler Childers, Nikki Lane, and Parker Millsap. We decided to grow our distribution. Hoosiers living in Louisville and Chicago are now able to get Sun King at their local retailer, bars, and restaurants around town. 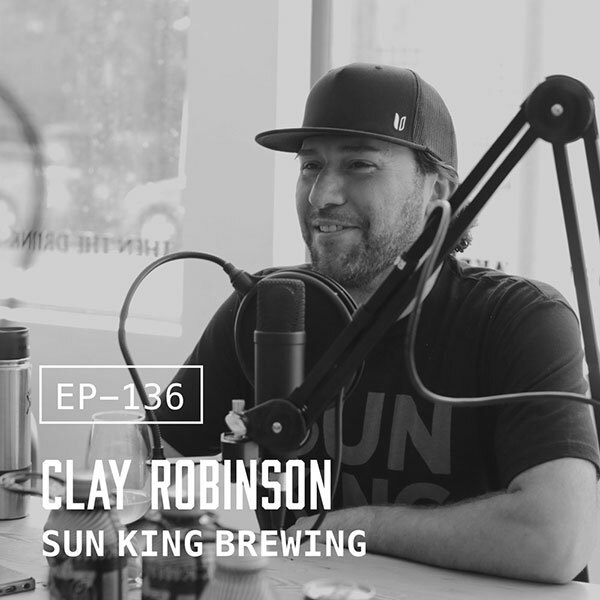 Sun King co-founder, Clay Robinson, spent some time with Good Beer Hunting talking about our “never say never attitude” and about why Sun King looked into grocery chains and conventional distribution. Check out his down to earth interview while launching the Chicagoland market. 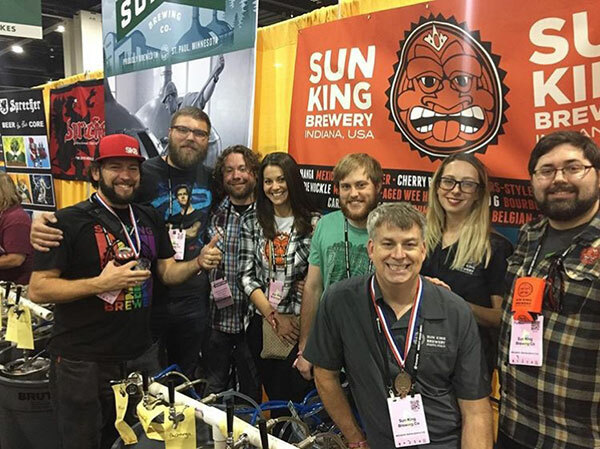 The SKB Crew traveled to Denver in October for the Great American Beer Festival where we were awarded two medals! Magpie Muckle took home a silver medal in the Wood and Barrel-Aged Beer category and a bronze medal in the Belgian-Style Fruit Beer category for Cherry Busey. Three-peat medal winner Cherry Busey will be making an appearance in cans this summer! In the middle of all of the ruckus of a beautiful Indiana summer, Sun King made the announcement that we will be opening a distillery in Carmel, IN. We are excited about opening our doors to the distillery in the late spring of 2018. Sun King plans on making artisanal gins, moonshine, and other spirits. We will continue to update you along the way and be sure to follow us on Facebook. Working with our community partners was a huge part of our year. In 2017, we had an economic impact of $932,600 from in-kind and monetary donations via the CANvitational profits, our Growler Give Back program, and tip jar donations. The SKB crew was also busy logging 471 volunteer hours and serving on 17 central Indiana committees and boards. We feel so fortunate to work with over 500 organizations, including the 8 nonprofits (IndyHub, Art With A Heart, Indy City Market, Gleaners Food Bank, Little Red Door, Joy's House, Second Helpings, Outreach Inc) that made up our 100 CANvitational volunteers. These 8 organizations each received a check for $2K from the event proceeds. We could not have done this without our sponsors, patrons, and the 60 participating breweries that CAN! CANvitational 2018 is scheduled for Saturday, September 8th, 2018. Invitations will be reaching breweries mailboxes soon! Stay connected for updates on those participating in the festival. In closing, we want to thank each and every one of you for your support in 2017. We have so much to look forward to in 2018 and we hope you will join us for some our adventures in 2018. The lights will sparkle a bit brighter with this beer cocktail recipe! Sun King Culinary Director, Steven Unrue, stirred things up with Chernobyl Nights featuring When the Lights Go Out (coffee porter). Cheers to the holidays! Combine heavy cream and vanilla in a small mixing bowl and whisk until soft peaks form. Set aside. In a Boston style shaker with ice, combine vodka and coffee liquor, stir to combine and chill. Strain into 2 glasses and top each with 6 oz of When the Lights Go Out. Gently spoon whip cream on top. Out of ideas for the Sun King fan on your holiday gift list? We've got you covered! Click on the links to purchase or stop by either Sun King location and pick up today. In order to receive your package by Christmas, please order online by no later than 12/18/17. These bad boys keep your beer cold up to 24 hours and hot drinks (hopefully not your beer!) up to 6 hours. Still stumped...How about a gift card! Calling all Indianapolis trivia lovers! On Monday, December 11, IndyHub, in conjunction with the Indiana Pacers, Indiana Sports Corp., and Sun King Brewery will be hosting a trivia night based on Indianapolis sports history. We couldn’t think of a better way to spend a Monday night! As most Hoosiers already know, Indianapolis has had a very entertaining sports scene for many years. This is your chance to relive those entertaining moments and also learn a thing or two from the people inside these great sports entities. Topics covered range from Pacers and Fever history, to general Indianapolis sports facts. Fans of all generations (21 and over) will not want to miss this great event. Admission is of course free, and Sun King will have cold beer on tap, as well as a fresh selection of food from their newly added space, Oca. Bring your friends and family, form a team, and come ready to compete with fellow Indianapolis sports fans. Only the top 3 teams will win prizes, but no one will leave without having a blast! Please be sure to RSVP here, and come ready to show your knowledge of Indianapolis sports history! The Indianapolis City Market has been around about just as long as Indy has been a city; as a planned city, a public market space was always part of the design. However City Market had humble beginnings as an open air market, covered by a simple roof, where local farmers could gather to sell their wares. The Historic Market House we know and love today didn’t come around for some 40 years. The Market House was completed in 1886, and at the time included more market space stretching east toward Alabama Street, and the massive Tomlinson Hall to the west along Delaware Street. Tomlinson Hall was one of the original convention center style buildings; it saw presidential speeches, massive concerts, some of the first basketball games, and large gatherings such as the National Prohibition Convention of 1892 (times sure have changed)! The final show held in Tomlinson Hall, before it burned down in January 1958, took place just over 60 years ago, “The Fantabulous Rock N Roll Show of ‘57” showcased some 50 performers including Ray Charles and Bo Diddley. It is in honor of that show that City Market’s annual gala fundraiser, MRKT BALL, is themed after rock ‘n roll of the 1950’s this year! MRKT BALL is our current form of the old To Market To Market Ball, an event conceived decades past with the mission of saving the City Market from new “development” in downtown. Thanks to then-Mayor Richard Lugar and a dedicated community, City Market was saved and is now historically protected. Now, 131 years after the construction of the Historic Market House, our MRKT BALL party continues to serve as City Market’s primary fundraiser supporting building maintenance, operations, programming, and some creative placemaking projects. Our mission for 2018 is to expand upon and create projects that help make City Market a public place for human interaction, connection, recreation, and yes – eating! You can help make these projects a reality by rocking out with us at MRKT BALL! Come enjoy live music from local group Chamber Music as they perform 1950’s hits from big names such as Little Richard, Ray Charles, Jackie Wilson, Little Willie John, Sam & Dave, and Staple Singers! You’ll be able to enjoy drinks from Tomlinson Tap Room, free samples from a variety of City Market merchants (on top of some special menus! ), a photo booth, a silent auction, and other awesome activities. Read more about MRKT BALL 2017, and find ticket information, at MRKTBALLINDY.COM!